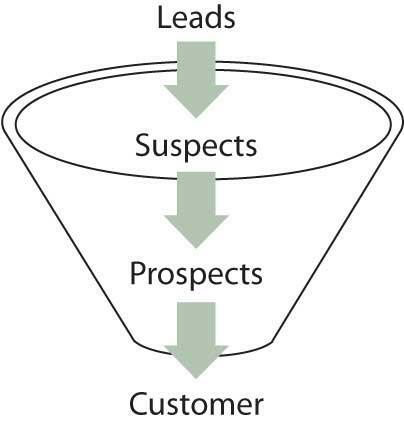 Are you marketing to customer prospects or customer suspects? By now most people are aware that Facebook likes, retweets on Twitter and recommendations on Linked In don’t pave a smooth road to customer acquisition. We’d all like that to be the case but it simply isn’t a linear equation. More likes don’t automatically lead to more customers. Nor do more tweets or more recommendations. I am frequently heard saying that digital marketing is direct marketing mainly due to the measurability of individual actions that depict the journey from prospect to customer. This is keeping in mind that there are infinitely more ‘suspects’ when it comes to future customers than there are prospects. So how can marketers tell the difference between customer suspects and prospects? The truth is – it’s not always possible but the employment of marketing science offers the ability to focus on the more likely prospects and more quickly dispense with the suspects. The suspects self-identify by rarely or never purchasing products that they have liked, retweeted about or recommended. The use of customer data modeling complete with third-party transactional data overlaid is a critical element in being a smart marketer. All too often I hear clients talk about views and engagement like watching a video or making a comment on a brand as being the primary campaign measuring in the digital world. While I agree that what we term as ‘micro-conversions’ are extremely important, if those incremental steps toward conversion are not measured against the individual’s actual behavior both within the platform as well as historically from third parties, then likes, tweets, and recommendations have little value. Direct marketers have been all over the idea of micro-conversions for many years even if it was not called that. In the golden days of magazine circulation (pre-internet) and subscription marketing, getting customers to renew their subscription through the mail could sometimes require seven or more separate mailings to a subscriber. Crazy right? The trick was to (through the use of data modeling) figure out when to NOT send an appeal based on customer behavior as well as customer look-alike behavior. An example – I was never one to respond to an early appeal to renew my magazine subscription preferring to wait until the subscription was actually canceled as I knew it would be a rare occurrence that the magazine would cease to be mailed to me until long after my subscription had expired. So if there were seven efforts in a renewal sequence I might be served only effort three, five and seven due to my history of never responding early. Not mailing me four efforts in the sequence is saved money that goes right to the bottom line. Since digital marketing and in particular email marketing are vastly less expensive than marketing through the mail, the need for efficiency in a marketing effort is often overlooked. That has to change or we will all drown in a sea of irrelevant marketing messages. Just because I like something does not mean I am a prospective customer. Nor does it mean I want to see posts from the marketer or receive invitations to the marketer’s events etc. The employment of predictive modeling should be used to determine my likelihood in becoming a customer – moving me from suspect to prospect. Yes of course it’s a numbers game and just by liking a Justin Timberlake video identifies me as someone more likely to purchase music or videos having to do with Mr. Timberlake than someone that did not like the video. But if I’ve never bought any music or movies online (hypothetically) slamming me with offers to purchase will more likely turn me off than make me want to purchase. Too many marketers subscribe to the idea that message frequency and offers can wear people down when I was never a prospective customer in the first place. People that don’t spend money aren’t customers. The key thing is having a better understanding of who is a customer prospect versus a customer suspect. This entry was posted in Advertising, Best business practices, Data collection, Data driven marketing, Digital media, Direct Mail, Direct marketing and tagged Marketing suspects and prospects, More likes equals more customers?, Renewal mailings, Value of Facebook likes, Value of LinkedIn recommendations, Value of Retweets. Bookmark the permalink.